Suited for off-line and outdoor riveting applications where compressed air is not available, BR-200M employs compact design and sets up to 3/16 in. rivets in all materials. Unit offers Quick Set trigger mechanism for rapid rivet placement and Ultra Jaws, which extend jaw life, all packaged in one molded plastic carrying case. Equipped with charger and battery pack, product outputs traction power of 1907 lb. Its 4 nosepieces in auxiliary kit are 3/32, 1/8, 5/32, and 3/16 in. 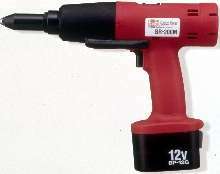 May 09, 2003 - St. Louis, Mo - S-B Industries has introduced the BR-200M 12V cordless electric riveter. Equipped with charger and battery pack, the BR-200M is ideal for off-line and outdoor riveting applications where compressed air is not available. Its compact design, light weight and longer strokes increase productivity. The BR-200M sets up to 3/16" rivets in all materials. It features a "Quick Set" trigger mechanism for rapid rivet placement and "Ultra Jaws" for longer jaw life, all packaged in a molded plastic carrying case for convenient field use. The BR 200M outputs traction power of 1907 pounds, and is powered by a 12 volt N./Cd battery. Battery pack included, the tool is 12.0 inches in length, 8.9 inches high and weighs just 4.4 pounds. Its four nosepieces in the auxiliary kit are 3/32", 1/8", 5/32" and 3/16". St. Louis-based S-B Industries is the North American Service Center for Lobster Tools, and offers the industry's most comprehensive line of blind rivet and rivet nut equipment. For additional information on the BR-200M, SB Industries or Lobster Tools, or to view product information, visit www.sbrivetguns.com or call 800-543-1011. Deburring/Chamfering Tools are designed for plastic pipes. Cleanout Tool dislodges A/C condensate drain line blockages. Cordless Drill/Driver features attachment to increase torque. Small Angle Grinders feature kickback protection.